Huzzah! I’m actually making my central Texas signing event come to fruition. I’d feared this wouldn’t happen after learning that Hastings is going out of business, but I’ve since found the perfect event. I’m going to sponsor a local race, and do a signing after. The best part? You can dress up like a zombie or survivor, run/walk a 5k race, get a race shirt with my CYP logo on it, then join me for a signing afterwards. Or just show up for the signing, that’s fine too. Hurry, there’s not much time to register! Thanks for reading! What do YOU think? Are you able to make it? This is a post I’ve been sitting on for a while now. After all, there is no established, “right” time to reveal a cover for a new book and I’ve been struggling to find that perfect moment. 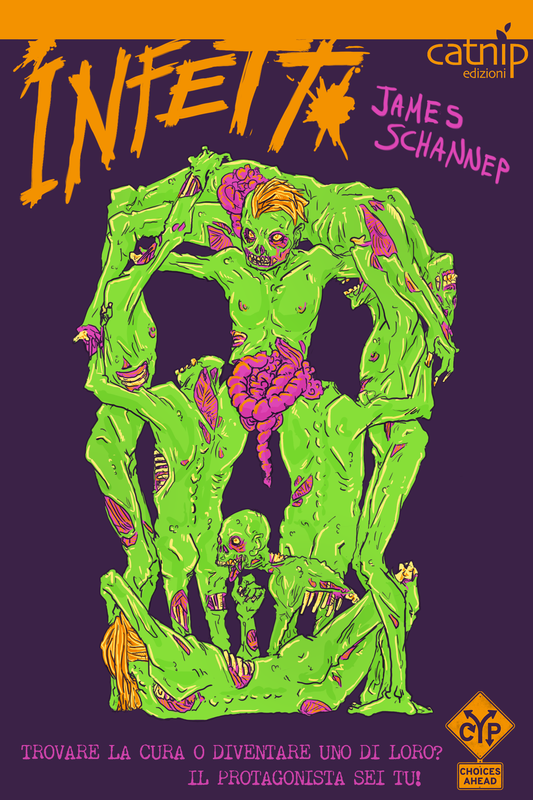 My cover artist, Brian Silveira, has been dying in slow agony as I’ve waited to reveal his epic artwork. I wanted a moment with some gravity, and I suppose this is it. I’ve gained feedback from multiple sources (some of you might be reading this now, I suspect), and used those notes to make the book a more compelling read. Thank you, Beta Readers, I am incredibly grateful for your time and diligence. Now the rewrites are completed and the book is off to my professional editor. 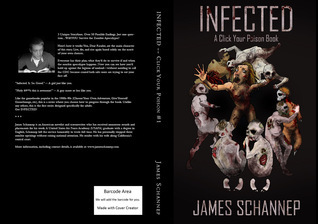 Once she’s done, it’ll go to formatting, the book will pop up as a pre-order (for about a week so I can finalize the product page) and then — BOOM — you’ll have PATHOGENS on your favorite reading device. For now, let me knock your socks off as Brian did for me. Click Me for Full Size. The fact that the cover is actually a lab door. You see, “the company” was a major aspect to the first book, but now you’re getting a deeper look –and one that goes far beyond the lab itself. The Gilgazyme inhaler on the floor, the mouse on the foreground and the mice eyes in the lab. It’s all already happened. 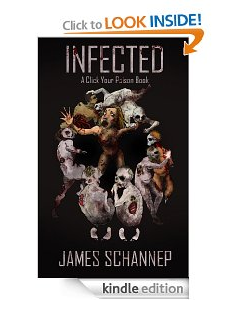 I don’t think of this book as a sequel or prequel to INFECTED. More of a spin-off. A sister book, if you will. 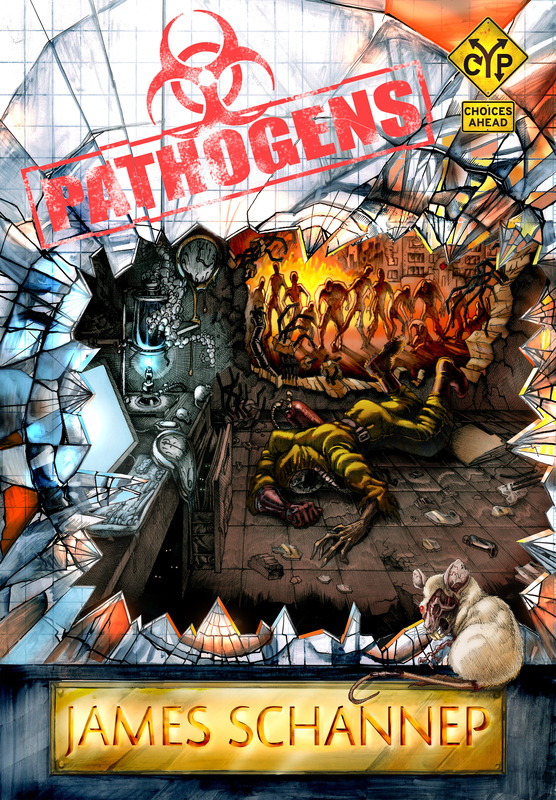 The events in PATHOGENS take place after INFECTED has already begun and end before that book concludes. The rebar from the explosion looks a lot like clawed hands. In my last interactive zombie tome, your primary enemy was the undead themselves. That’s still the case here, but you’ll also have to deal with a (perhaps) larger threat: the death of civilization and the evil in men. The colors evoke a sunset. Yep, goodbye mankind. It’s up to you, Dear Reader, to help these characters survive another day. The hospital symbol in the rear. A small detail, but many of the events circle around this location. Thanks for reading! What do you think of the cover? What’s new? Quite a bit with me, as it turns out. May was a huge month in the world of Click Your Poison, with a new book launch, and a $0.99 sale for the series. In fact, I had over a thousand ebook sales on Amazon for the month! Weee! (SUPERPOWERED is still on sale for the next two weeks). I also did a live interview/chat on google+ which you can watch a recording of below. In it, I announced my plans for the next book, which I’ll go more into after the jump. For CYP#4, I’m returning to the storyworld of INFECTED. You’ll get to play as the supporting cast from the original, to survive the initial outbreak from each of their perspectives. While it’s technically a prequel, I think of it more as a sister story, and you don’t need to have INFECTED memorized to enjoy INFECTED Origins. For me, I see it as a challenge as a writer and an opportunity to grow. I’ve tried to keep out of your head and did my best to keep telling-you-what-you’re-thinking to a minimum, and to make the protagonist’s age, gender, and race as neutral as I can so you could better delve into the story as a reader. But not with this book. Each character has a rich background with firm viewpoints about the world. So you’ll get to Being John Malkovich the story and ride along in someone else’s head. Crazy? Maybe. We’ll see. Stay tuned for updates as the book comes along. I probably won’t have room for every single character in the book, so expect cast announcements as well. If there’s someone you think is a must-have for the book, let me know in the comments below. Oh, and I’m doing a rafflecopter contest thinger too. Check it out: a Rafflecopter giveaway.